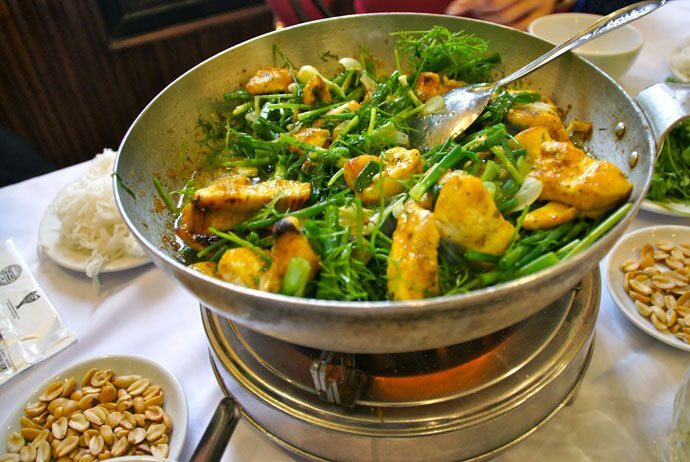 Vietnam Culinary is the combination of the food processing methods, spices blending principles, and general eating habits of Vietnamese people. 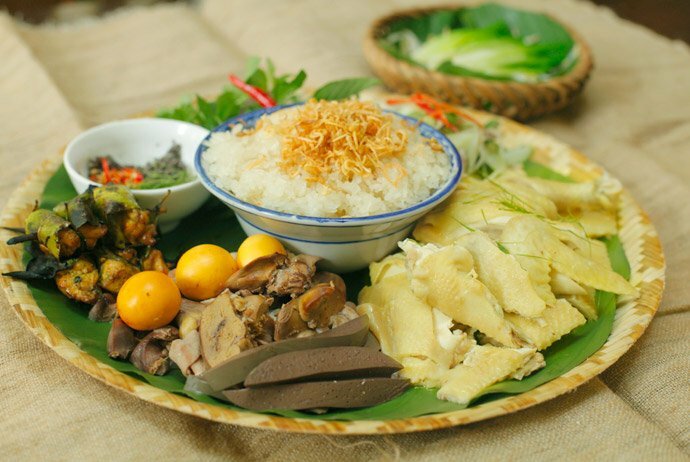 Despite of some differences depending on regions, Vietnam culinary generally shows all popular dishes in the ethnic minorities which were relatively common in the overall Vietnam community. Vietnamese cuisine encompasses the beverages and foods of Vietnam, and shows the combination of 5 fundamental taste elements in general. 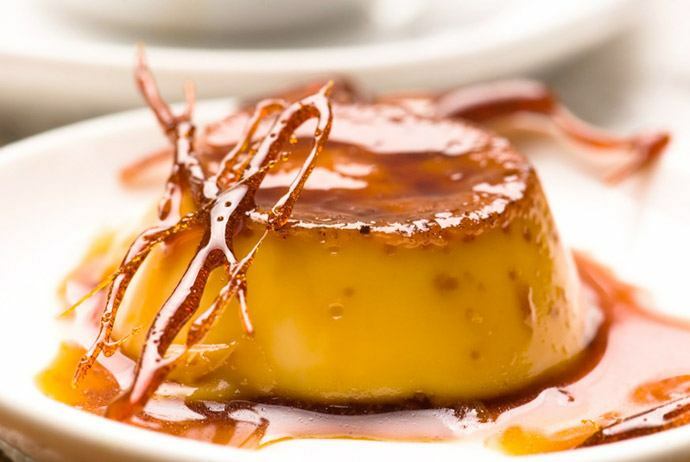 Each dish has its distinctive flavor, reflecting one or more of the basic flavor elements. Vietnam territory is divided into three distinct regions: the North, the Central and the South. The main characteristics of geography, culture, ethnicity, and climate prescribe specific characteristics of each region’s cuisine. Every region has a sharp, specific taste characteristic. This contributes to the richness, diversity of Vietnam culinary. Vietnamese people commonly use some ingredients, including shrimp paste, fish sauce, rice, soy sauce, fresh vegetables, fruits, and herbs. 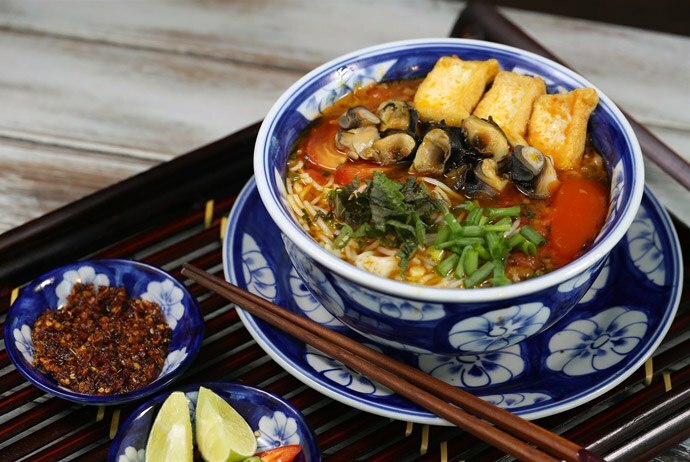 In fact, Vietnamese food uses a lot of vegetables (boiled, fried, making pickle, eaten raw) and many types of broth and soup, especially which have sour flavor, whereas the consumption of nutritious food from animals is less often used. 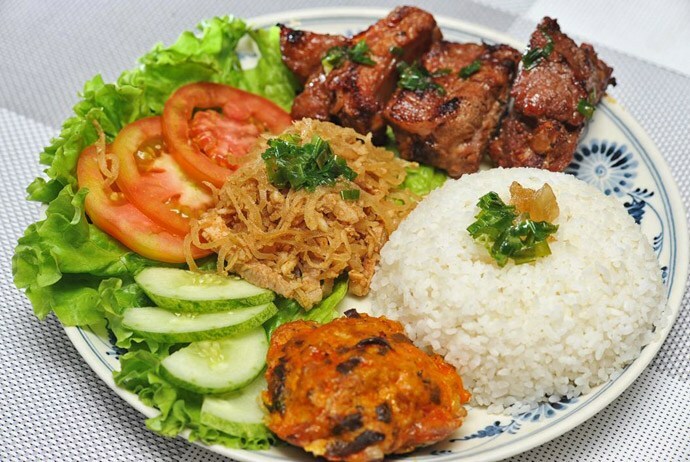 There are some kinds of meat which is most commonly used in Vietnam’s meals, including pork, beef, chicken, geese, duck, shrimps, fish, crabs, snails, mussels, clams, and so on. There are also some dishes from less common animal food sources, such as dog meat, goat meat, turtle, snake, tortoise meat. They are usually not the main meat sources. They are just considered special food and are only served in certain festival occasions, usually with alcohol. 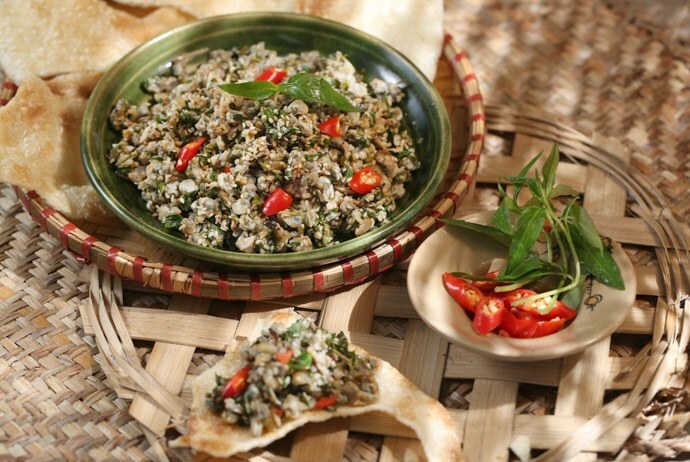 Vietnam also has a number of Buddhist vegetarian dishes made ​​from plants. 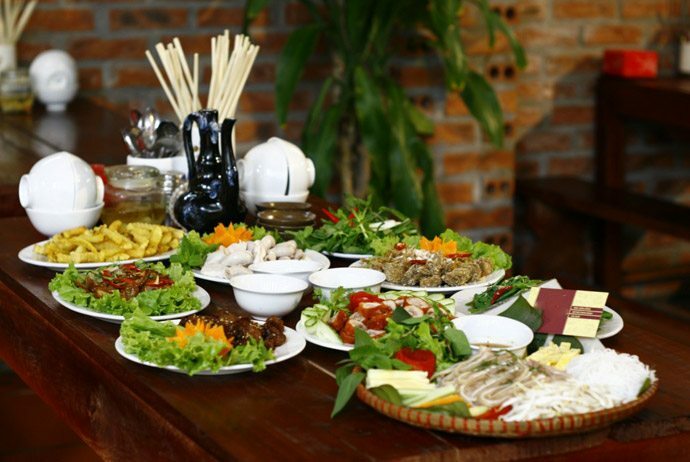 There is a specific feature which distinguishes Vietnam’s culinary with other countries’: Vietnam cuisine strongly focuses on the deliciousness, not the nutrition. Many aromatic herbs, such as basil, shiso/ perilla, marjoram, onion, cumin, eryngium, etc. While enjoying the food, the mixing of materials mentioned above becomes more and more obvious: Vietnamese people rarely eat each dish alone or in order. In every meal, they always enjoy all of the dishes on the table from start to finish. Another special feature of Vietnam’s cuisine that other countries, especially Western countries do not have – that is fish sauce. Fish sauce is frequently used in most of the Vietnamese dishes. There are also many sauces such as thick soy sauce (made from soy). The sauce bowl will be shared on the tray, making the food taste better, as well as expressing Vietnam’s close-knit community. Northern cuisine is often not spicy, fatty, and sweet compared to other regions. It mainly uses diluted fish sauce and shrimp paste. Northern people use more vegetable dishes and fresh seafood which are readily available, such as shrimp, crabs, fish, clams, mussels, etc. Generally, because of the poor agriculture, northern culinary in the past had few popular dishes with the main ingredients from meat and fish. 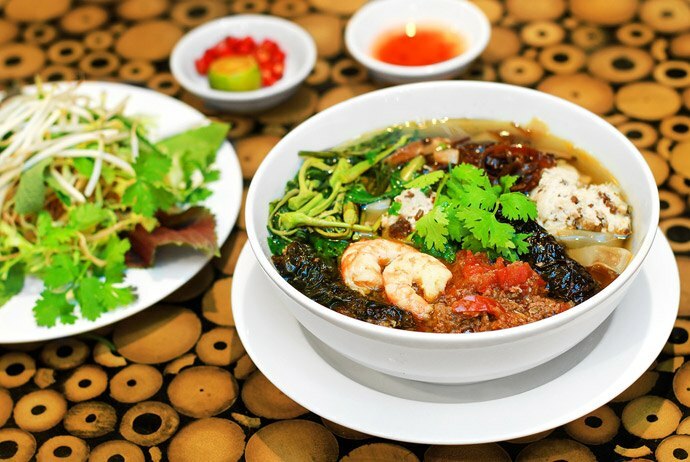 Many people appreciate Hanoi cuisine, considering that it represents the most typical of the North Vietnam culinary elite with Pho (Vietnamese rice noodle), Bun Thang (vermicelli and chicken soup), Bun Cha (noodles and grilled meat), Vong green rice flakes, Banh Cuon Thanh Tri (Thanh Tri steamed rolled rice pancake), and special spices like belostomatidae oil, basil,…They are also the best traditional Vietnamese food that visitors should try once when coming to the North Vietnam. Central food with all its unique characteristics reflected in distinct flavor, with more spicy and salty dishes than the food in the North and the South. The dishes’ colors are blended brilliantly, especially with natural red and brown colors. 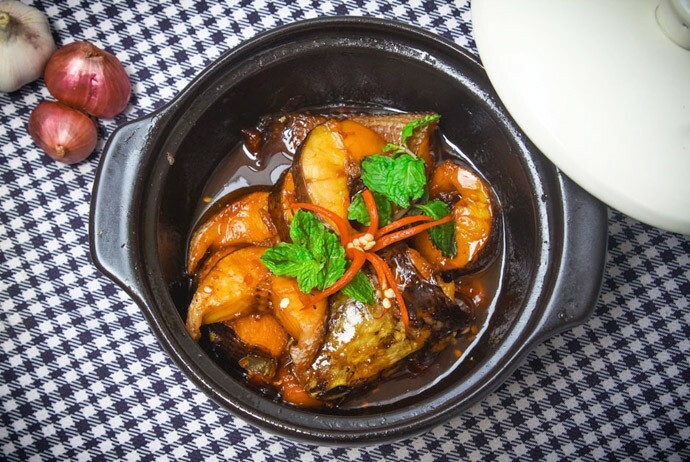 Some Central provinces, such as Hue, Da Nang, Binh Dinh are famous for sour shrimp sauce and many other types of shrimp sauce. 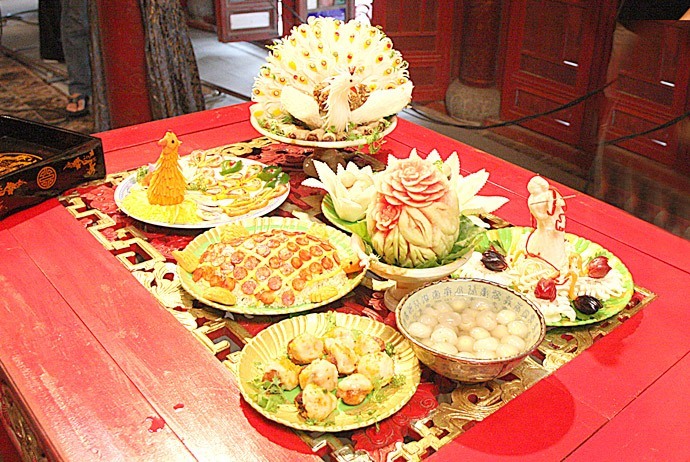 In particular, nowadays Hue cuisine was mostly affected by Hue royal cuisine, so it requires high levels of food processing and decorating techniques. On the other hand, locals in the past could not produce a lot of special food while royal cuisine required a large amount of materials, so every kind of material are processed diversely, resulted in many different dishes. Southern cuisine is much influenced by the culinary of Chinese, Cambodia, and Thailand. Southern food uses a little bit more sugar and coconut water and coconut milk. This cuisine also produces numerous types of dried fish, such as mam ca sac (Belontiidae paste), mam bo hoc (prahok), mam ba khia (sesarmid paste), etc. Southern cuisine also contains more saltwater and brackish water seafood than the North (fish, shrimp, crabs, sea snails), and it is very special with rustic dishes – the typical of the land opening process in the past. Nowadays, there are so many dishes becoming specialties: voles steamed with coconut water, steamed flying fox with soya, ground green bean copperhead porridge, coconut larvae, grilled snakehead, etc. 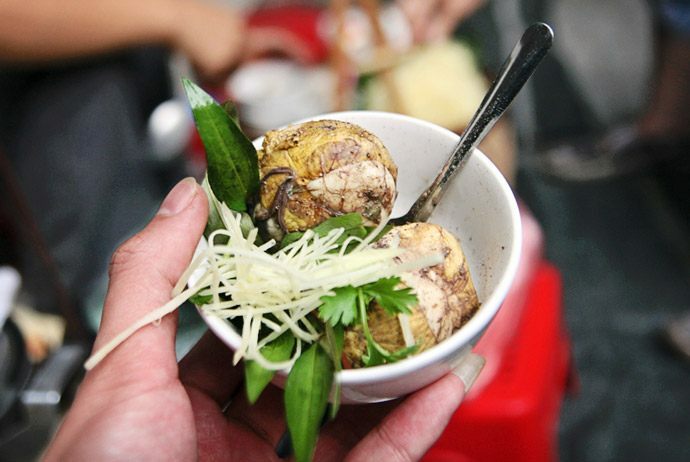 They have weird names but are among the best traditional Vietnamese food you should try! Rice vermicelli served with crab soup, made from crab, milled crab body; filter the results with garcinia multiflora, tomatoes, water, and cooking oil, wine vinegar, fish sauce, salt, and scallion. They are also among the most delicious Vietnamese food visitors should try when coming to Vietnam. – Banh Canh – Soup cake (South): Made from ordinary rice flour, wheat flour, cassava flour or ordinary rice flour mixed with cassava flour, cut into big and short fibers, cook wilth broth from shrimp, fish, and pork leg with spices depending on the types. 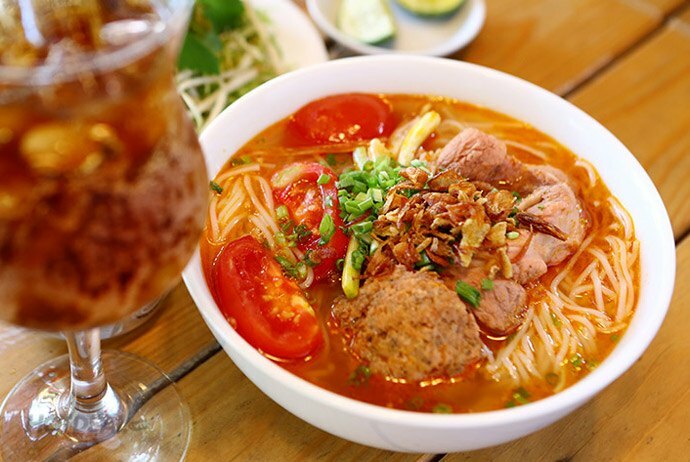 – Bun Thang – Vermicelli soup with chicken, egg, pork (Ha noi): vermicelli served with broth and requires 20 ingredients: laksa leaves, eryngium foetidum, thin fried egg, shredded chicken breast, thin cut Vietnamese pork roll, rousong and Chinese sausage. 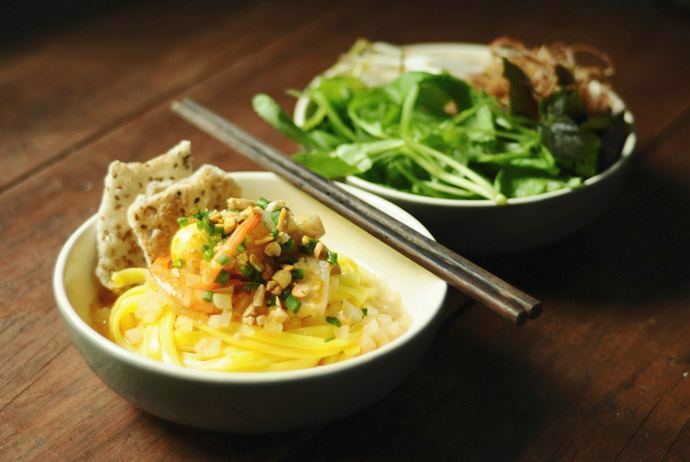 – Cao Lau (Hoi An): Hoi An specialty, including meticulously prepared noodle served with bean sprouts and char siu. – Hu Tieu – Kuy teav (South): kuy teav noodle served with broth cooked with minced pork and pig intestine and fresh ingredients including bean sprouts, chives. Noodles made from finely ground rice flour and coated in thin layers, then cut horizontally into about 2mm thin noodles. Noodles made ​​of wheat flour mixed with additives for crunchy and chewy effects. Noodles will be served with fresh greens, pork, shrimp, chicken, and broth. 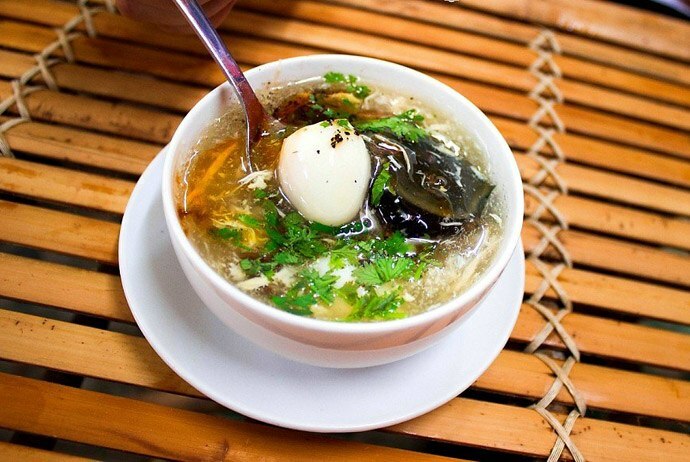 – Pho – Vietnamese noodle soup (Hanoi, Nam Dinh): one of the most typical dishes for the Vietnam culinary. The main ingredients of Pho are large, flat vermicelli and broth with sliced ​​thin beef or chicken. It also accompanies condiments such as soy sauce, pepper, lemon juice, fish sauce, chili, .. They are also among the most delicious Vietnamese food visitors should try when coming to these locals in Vietnam. Made from ordinary rice by cooking it with a sufficient amount of water. This only contains raw material – ordinary rice – without any kind of spice. Com Te is almost the daily food of Vietnamese people. Com Te can be served with many dishes. Normally, the daily food meals of Vietnamese people will include a bowl of rice and selected dishes, served with a bowl of soup. – Com Nep – Sticky rice: Com Nep is made from sticky rice, differ mainly in the cooking method compared to Xoi. It is cooked directly with the water, not cooked by steam. – Com Chay – Elderberry (Ninh Binh, Hai Phong): Elderberry is the rice lying in the bottom of the pot when cooking rice. 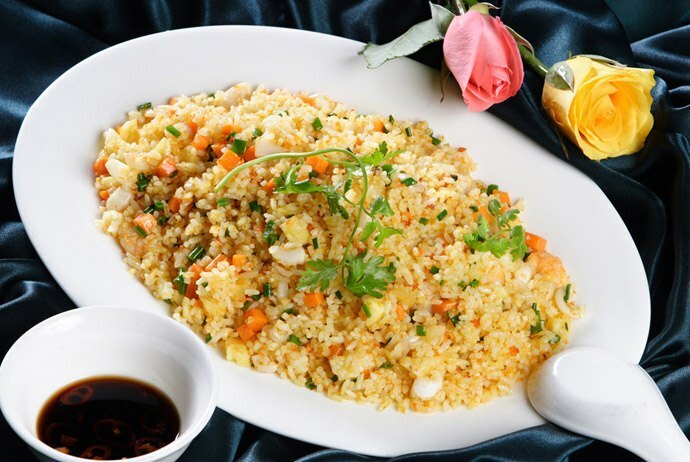 It is usually golden crispy rice, naturally parched under the sun for 2 or 3 times on fresh space to avoid mildew. It will be fried crisply and sold to people as a specility of Ninh Binh. Rice mixed with boiled clams, clam broth, Ruoc (sergestidae) paste, cabbage, greaves, grilled coated cake, crispy fried noodles, colored peppers, peanuts, cooked oil, pepper, and salt. – Com Ga Quang Nam – Quang Nam chicken rice (Quang Nam): cooked glutinous rice served with boiled chicken and chicken broth. – Com Lam – Sticky rice cooked in bamboo tubes (Midland mountainous north, Highland): Made from glutinous rice and some other ingredients. The ingredients will be added into bamboo, or ride tubes and cooked over the fire. – Com Nam – Rolled rice/ rice ball (North): This is the dish which has appeared since a very long time ago. Hot steamed rice will be compacted into sheets by two hands, sliced ​​into medium pieces, and served with salted sesame. Com Nam is limber, salty, and sweet. A broken rice plate usually has ribs, pork skin, rolls, eggs, or even does not fully include those dishes but it definitely needs to be served with sweet sauce. – Cá Khô – Dried fish: gutted, bisected, and dried in the sun fresh whole fish. Before being dried, the fish will be rubbing salt to assist preservation. Dried mackerel and arius thalassinus rüppell are favored by many people. 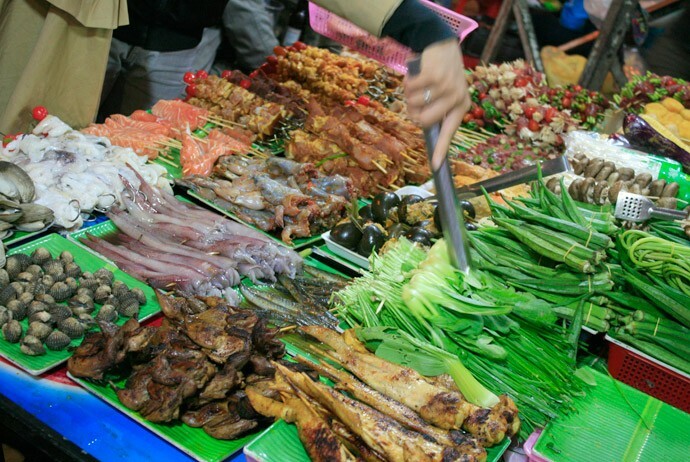 – Cha Nuong – Grilled meat: Pieces of pork, beef, fish, shrimp, squid …with appropriate size, cut into pieces (cha mieng) or minced (cha vien – quenelle), grinded or pureed and fried or baked. – Doi – Vietnamese pork sausage: Large intestine is filled with a mixture of pork blood, vegetables, spices, garlic, peanuts, and green beans. After it is filled with enough ingredients, it will be steamed or grilled. – Dua Muoi – Pickled vegetables: A variety of vegetables and fruits mixed with salt in a certain percentage according to people’s food experience so that it is not too salty nor too light. – Ruoc – Salted shredded meat: made from lean pork, or chicken with bones and skin removed, boneless and skinless fish, or cooked shrimp, then grind the ingredients with a pestle. Then, continue roasting it with a pan over a low fire. – Thit Kho – Braised pork: Put pork (always include lard, if not, add lard or oil) into the pot and boil until cooked, add sauce for suitable salty level. Sticky rice made with coconut milk and pineapple leaf, served with tore boiled chicken or roasted chicken, sliced Chinese sausage, and presented to the bowl. – Xoi Gac – Gac fruit sticky rice: A common tasty and nutritious dish, which is popular as a dish for worshiping days, holidays, anniversaries, or comes with suckling pig on a tray for engagement ceremony. Gac fruit is used for red color and creating a fresh and delicious taste for the dish. – Xoi Nep Cam – Violet sticky rice: Similar to steamed sticky rice with pureed green beans, but combined with the decoction of magenta plant to get the purple red color. Peanuts boiled until they are softly cooked, mixed with soaked glutinous rice and steamed in the normal way of making sticky rice. – Xoi Trang – Basic sticky rice: ordinary sticky rice steamed, served with many dishes, such as braised pork, meat pie, egg, Chinese sausage, and salted shredded meat. – Xoi Vo – Sticky rice cooked with split peas: A special feature of this type of sticky rice is that the particles are separated and flexible yet still sticky. Nearly the same as steamed sticky rice with cooked and pureed green beans, but this kind of sticky rice was made with pineapple leaves for fragrance, and it may contains a little turmeric powder for eye-catching yellow color. – Xoi Do Den – Black beans sticky rice (North, Central): Black bean bark rubbed, soaked and peeled (or you can leave the bark), mixed with glutinous rice and steamed. 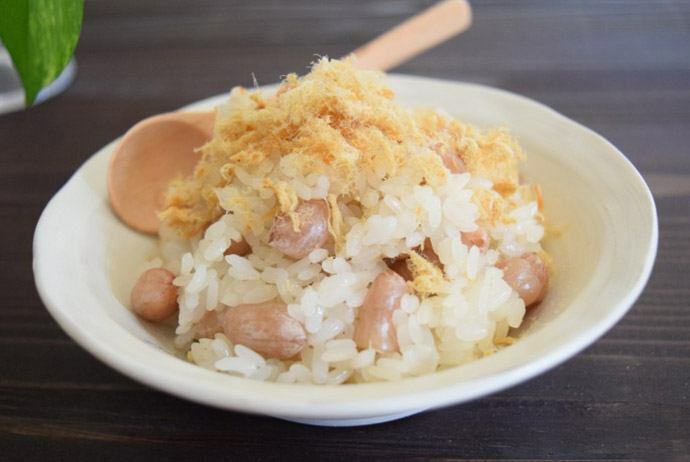 This is a popular sticky rice and there are many similar types of sticky rice made with beans. Glutinous rice cooked in the combination of decoction of green rice, red rice, yellow rice leaves to get colors. It is popular in ethnic minorities (Muong, Tay, Thai). 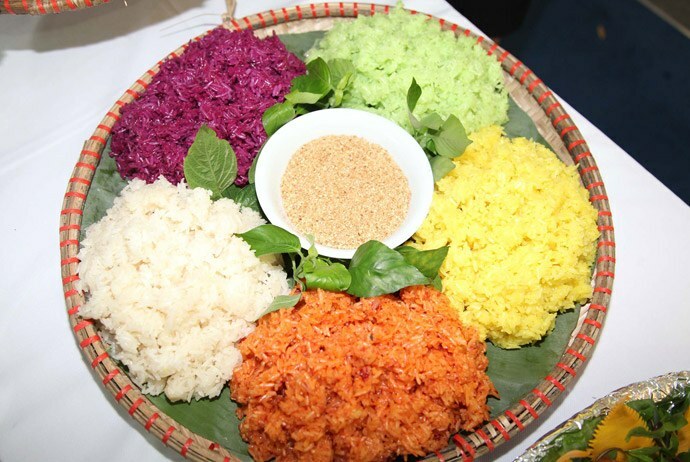 Five colors of the sticky rice symbolize the five basic elements in the universe. – Xoi San – Cassava sticky rice (North): glutinous rice mixed with cassava cell lines or cassava cut into small pieces, steamed, and served with fried onion and grease. – Xoi Xeo – Steamed sticky rice (Hanoi): Sticky rice placed in the bowl, served with knife-thin sliced green beans on top, sprinkled with onion and grease. It is considered as one of the most delicious sticky rice dishes which are hard to cook. 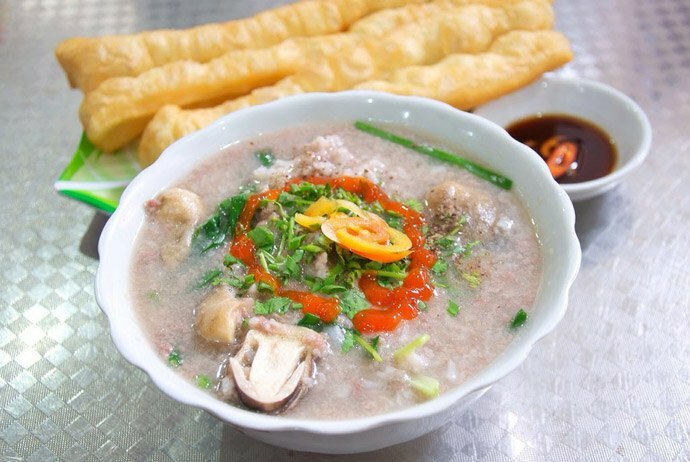 Porridge made with the fresh broth from pork bone or pig boiled intestine, and the indispensable main materials served in the intestine porridge bowl are boiled pork innards, including pork intestine, liver, gizzard, heart, and kidney. – Chao Trang – Basic Porridge: Well-cooked ordinary rice with the proportion of water are 3 times more than rice. – Lau – Hotpot: Includes a pot of boiling broth, fresh food put around for people to pick up and drop into the broth, wait for the food to be cooked, and enjoy when they are still hot. – Canh Muop Dang Nhoi Thit – Pork stuffed in bitter melon soup: Bitter melon stuffed with pork, binded by scallion and cooked in the bone broth. – Sup Cua – Crab Soup: The soup cooked with crab meat, eggs, or quail eggs. Chicken bones and corn are also used to make the soup more nutritious and sweet. – Sup Yen – Nest soup: A luxurious, expensive, and nutritious soup cooked from oats and sugar. 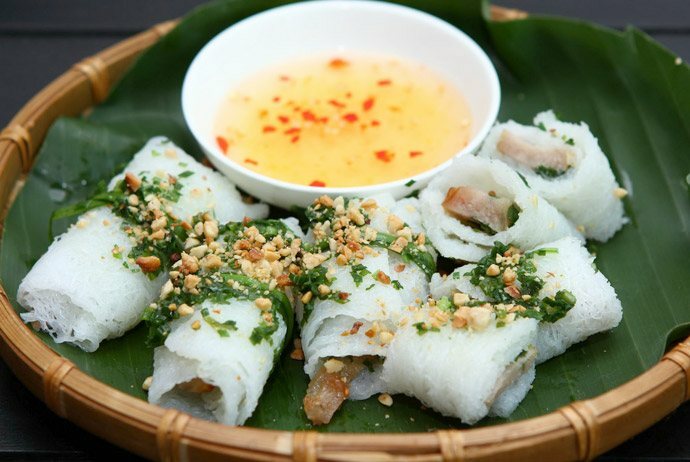 – Banh Cuon – Steamed rolled rice pancake: thin coated powder steamed, being eaten when it is still wet with fillings inside. Steamed rolled rice pancake are usually served with light sweet sour fish sauce. 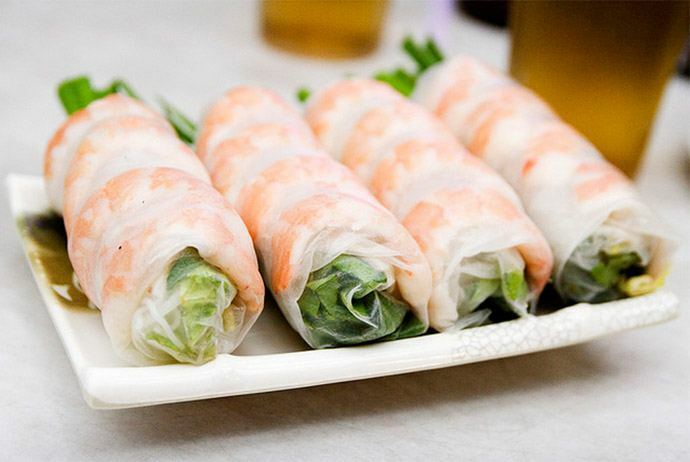 – Nem Cuon – Cool spring rolls: fresh veggies, rice noodles, and some cooked meats such as beef, pork, duck, shrimp, fish, crabs rolled in rice papers. Made from steamed wheat flour will fillings, including pork, black fungus, mushrooms, glass noodles, Chinese sausage, quail eggs, or chicken eggs. 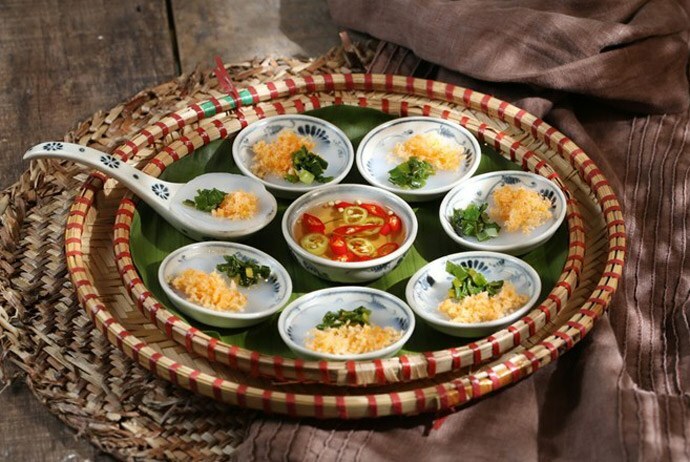 – Banh Day – Pounded sticky rice cake: Made from finely pounded sticky rice. It can have green bean and coconut filling with sweet or savory taste. Banh Day is made in the traditional Tet in Vietnam and on the Death Anniversary of Hung King. – Banh Duc – Vietnamese peanut rice cake: made from ordinary rice flour (in North and Central) or tapioca starch (South) with lime and some spices. 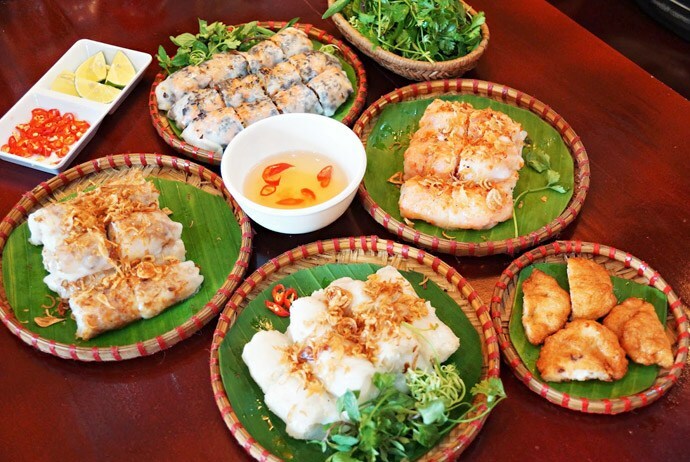 Banh Duc is made into large sheets, cut into small pieces when being served. – Banh Gio – Pyramidal rice dumpling: Made from filtered ordinary rice flour, pork, fungus, onions, pepper, fish sauce, salt … Banh Gio has pyramidal shape as the facing hand. Made of laminated dough and deep fried. Traditionally, the filling of Pillow Cake is pork, but now chicken and beef are also used. – Banh Mi – Vietnamese bread: Vietnamese bread is usually gashed as a sandwich and some food will be nipped in between. There are a lot of bread kinds depending on different types of the fillings. Cakes made from ordinary rice flour with pureed shrimp sprinkled over the dish. The sauce is a mixture of sauce which is the main ingredient and is often dumped directly into the dish. 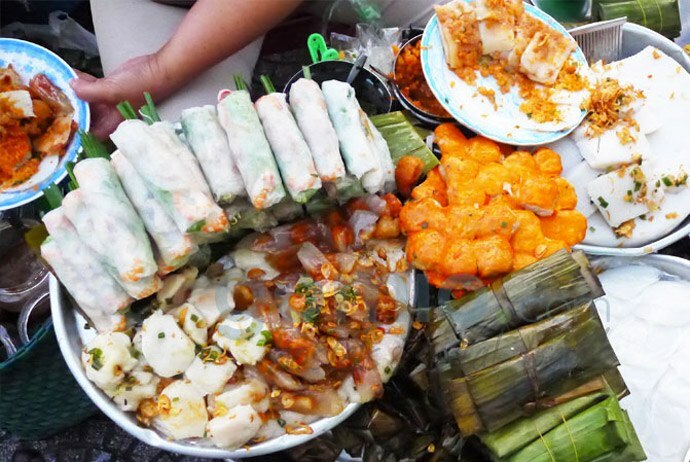 – Banh Chung – Square sticky rice cake (North): This is the single cake with long history in traditional cuisine of Vietnam which is being recalled in historical books. Banh Chung, or Chung cake have a special place in the minds of the Vietnamese people. – Banh Cong – Soc Trang bean-shrimp cup cake (Soc Trang): A mixture of minced pork mixed with cassava and wholegrain green beans with a shrimp lying on the cake. – Banh Khuc – Gnaphalium multiceps Wall. cake (North): made from Gnaphalium multiceps Wall.leaves, glutinous rice, green beans, lard wrapped in cooked sticky rice. 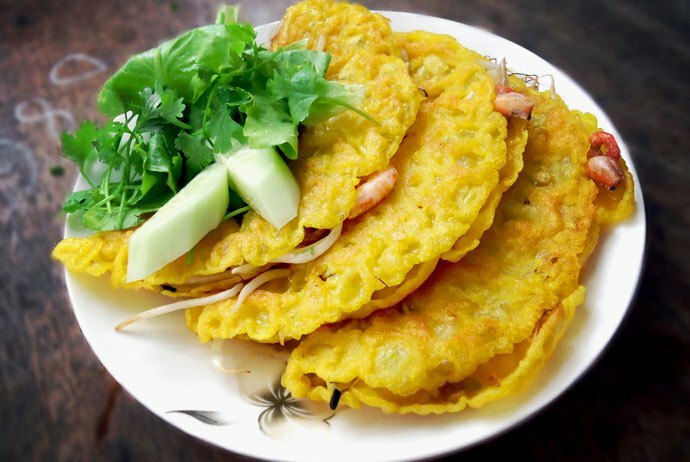 – Banh Tom Ho Tay – West Lake crispy shrimp cake (Hanoi): Shrimp (freshwater) catched from West Lake wrapped in wheat flour, fried in a hot pan with a lot of cooking oil until the cake becomes souffle, yellow, and spreads out mouth-watering aroma. 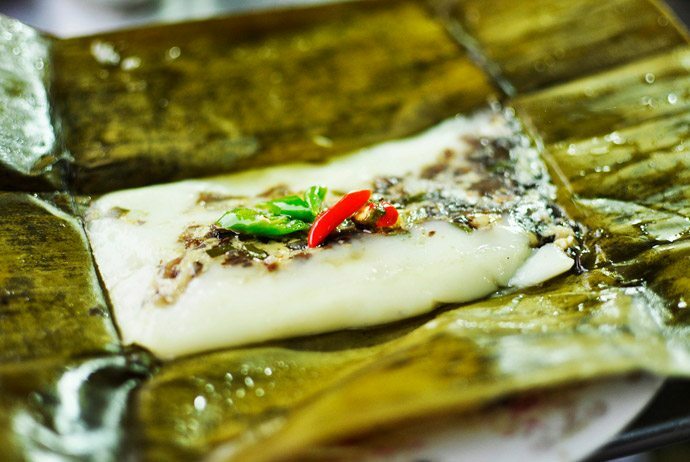 – Banh Nam – Steamed rice pancake with shrimp (Hue): Made from ordinary rice powder, Banh Nam is thin, flat with mushrooms, pork, pepper, and chilli on face, wrapped in banana leaves. – Banh Te – Rice cake (North): made from ordinary rice flour, wrapped in phrynium placentarium leaves and boiled in water. – Banh Tet – Cylinder sticky rice cake (South): Banh Tet is similar to Banh Chung in the north with same ingredients, cooking methods. The only difference is just in the shape and Banh Tet is wrapped in banana leaves instead of phrynium placentarium leaves. 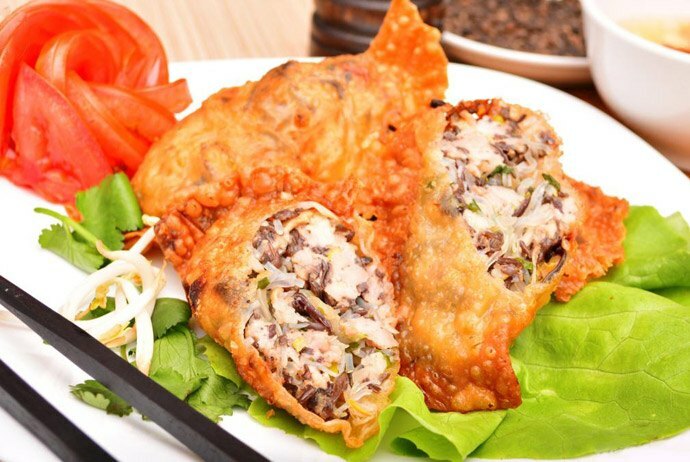 However, there are different kinds of Banh Tet, such as Banh Tet with banana or black beans stuffed inside. In brief, these dishes are among the most popular Vietnamese food visitors should try when coming to Vietnam. Cake made from wheat flour and banana, fried in a hot pan with a lot of cooking oil. – Banh Tai Heo – Pig ear cake: Made from wheat flour, sugar, white sesame, milk, eggs, butter, vanilla, vegetable oil, salt, water,…processed by crispying. Pig Ear Cake is salty, fleshy sweet, dry and very crunchy. – Banh Trung Thu – Moon cake: The traditional mid-autumn festival cake, which usually consists of a thin shell (thickness less than 1 cm), made of wheat flour, flavor, with a sweet and oily stuffing block. 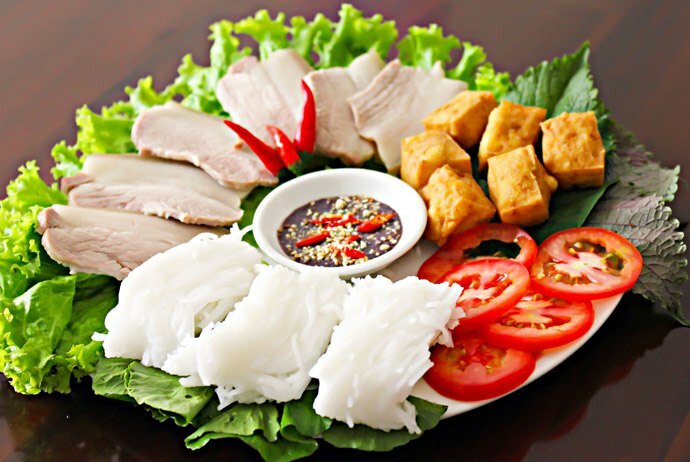 They are also the most popular Vietnamese food people should try when coming to visit Vietnam. – Banh Cay – Fiddler spongecake (Thai Binh): Made from glutinous rice, and other auxiliary materials such as Gac fruit (Momordica cochinchinensis) or the leaves of G. augusta, peanut, sesame, carrot, ginger, tangerine peel, and lard. – Banh Com – Green rice cake (Hanoi): Made from Vietnamese green rice, green beans, coconut, and pumpkin jam or lotus jam, commonly used for engagement ceremony. Green rice is mixed with water in a certain proportion, stired over the fire, or steamed with sugar water and grapefruit flower water. – Banh Da Lon – Pig skin cake (South): Made from flour, sugar, coconut, vanilla or pineapple leaves, and some other spices. Stuffings are made from finely ground and steamed green bean, taro, ordinary rice flour, and sugar. 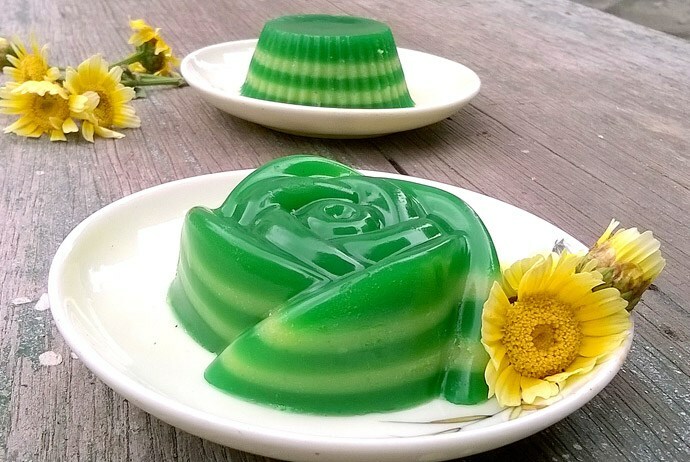 The shell of the cake is made from glutinous rice flour and boehmeria nivea leaves with the stuffing includes minced lard, essential oils of banana, coconut, and steamed green beans. The cake is square, black, wrapped in the brown leaves. – Banh Gio – Ash cake (North): Some types of leaves are burned to get the ash soaked with sticky rice for the golden brown color as amber, as well as the characteristic flavor of the cake. The most popular shape is the slender figure. Banh Gio is usually dipped in honey or molasses when being served. – Banh Khao (Hai Duong): made from glutinous flour roasted with sugar, with the stuffing includes pumpkin jam and lard. – Banh Lot (South): made from tapioca flour with the aroma of coconut milk, caramel, the green and white color of pineapple leaves, and sweet and cool taste. Made from glutinous rice flour mixed with molasses, stuffed with green bean and wrapped in banana leaves, steamed. 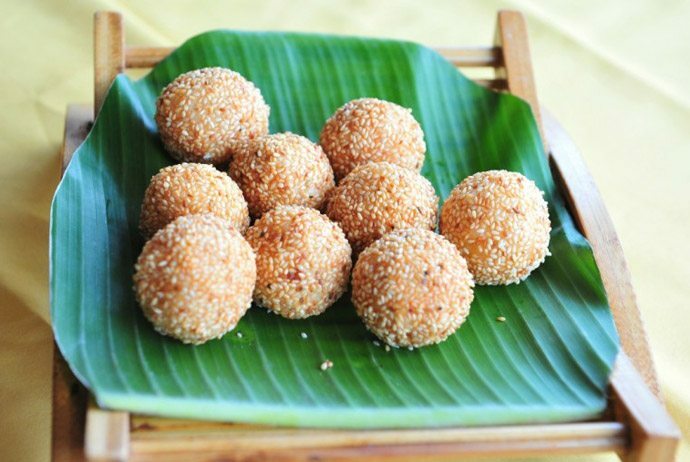 – Banh Nhan – Longan ball pastry (Nam Dinh): Made from aromatic glutinous rice or Hai Hau glutinous rice. In addition, it requires eggs, white sugar (or sugar candy), and lard. – Banh Ran – Vietnamese pancakes (North): Made from glutinous rice rolled into small balls with crushed green bean stuffed inside, fried in a lot of cooking oil until they become yellow and crispy. Banh Ran is usually covered by sugar or molasses. – Banh Troi, Banh Chay – Vietnamese sticky rice rolled cakes and vegetarian rolled cakes (North): Made from glutinous rice flour and ordinary rice flour, candy, grapefruit flower water, coconut, and hulled sesame. For vegetarian sticky rice rolled cake alone, green beans, sugar, cornstarch, or cassava flour, and slightly crushed ginger juice will be added. – Quay – Vietnamese Youtiao: Made from wheat flour added with baking powder, fried in cooking oil and comes with the shape of a pair of 2 long rods with the same size as small sausages stick together, tastes fleshy and crunchy. – Tiet Canh – Blood soup: fresh animal blood is mixed with a little fresh water or salt water to prevent it from being curdled before mixing with the flesh, chopped animal meat and cartilage to freeze the blood. Served with raw spice veggies. – Ca Loc Nuong Trui – Skewered grilled snakehead (South): Fresh fish (do not need to scale, remove mucus, eviscerate, marinate spices) just caught out of the river, washed, skewered using a long stick from mouth to tail, buryied on dry straw and grill. Marinated fish, grilled over charcoal, then fried on the pan with a lot of cooking oil. 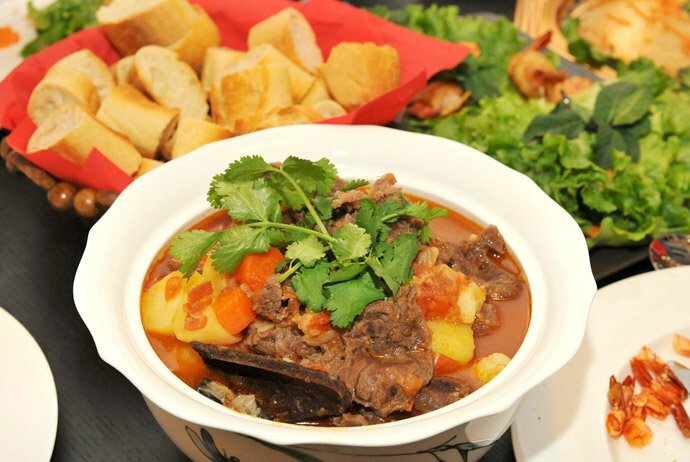 This dish is created by Doan family in Cha Ca Street in Ha Noi old quarter. They kept this business secret and named the dish. – Cha Ca Thac Lac – Bronze featherback fish pie (Dak Lak, Hue): Made from bronze featherback, usually from skinless and boneless bronze featherback, and then retired or pureed into dumplings, fried or diped in hotpot. 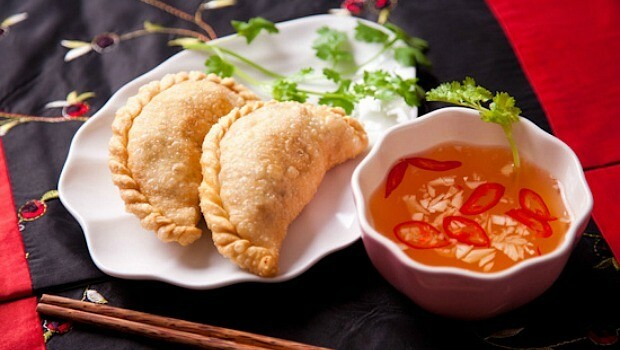 – Cha Chia – Pork and cuttle pie (Quang Ninh, Hai Phong): A cane with the size as a small finger, including the top covered with finely ground lean meat and cuttle while the bottom of the cane stick will be leaved as a holder. 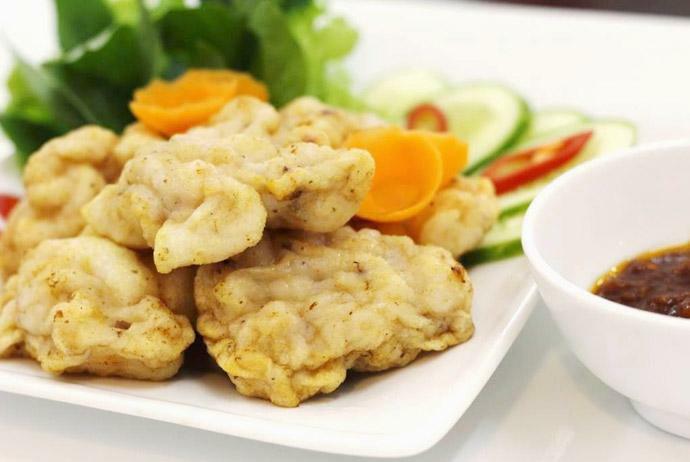 – Cha Muc – Cuttle pie (Quang Ninh): One kind of Halong specialty which is fussily made from crushed cuttle, cumin, scallion…squeezed into small pieces and overwhelmingly fried in cooking oil. Ngan is a krill living in Quang Ninh only. 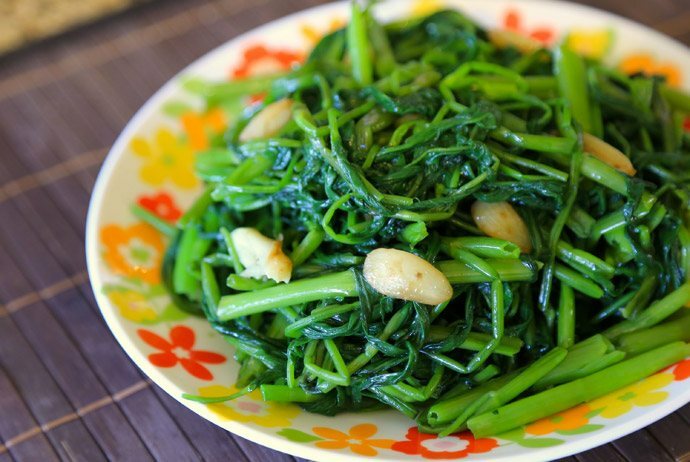 Ngan is very nutritious and can be processed by many different ways, creating many delicious dishes such as boiled Ngan, grilled Ngan, Ngan salad, Ngan porridge, Ngan vermicelli …Each dish has its own taste.